During my pregnancy I had an insatiably craving for chocolate chip scones. Unfortunately they are not easily accessible around me. It was a sad time as I visited coffee shop after coffee shop searching for the treat I was craving. When I could not find them I turned to the internet, and turned my search to a scone I didn’t feel so bad eating. 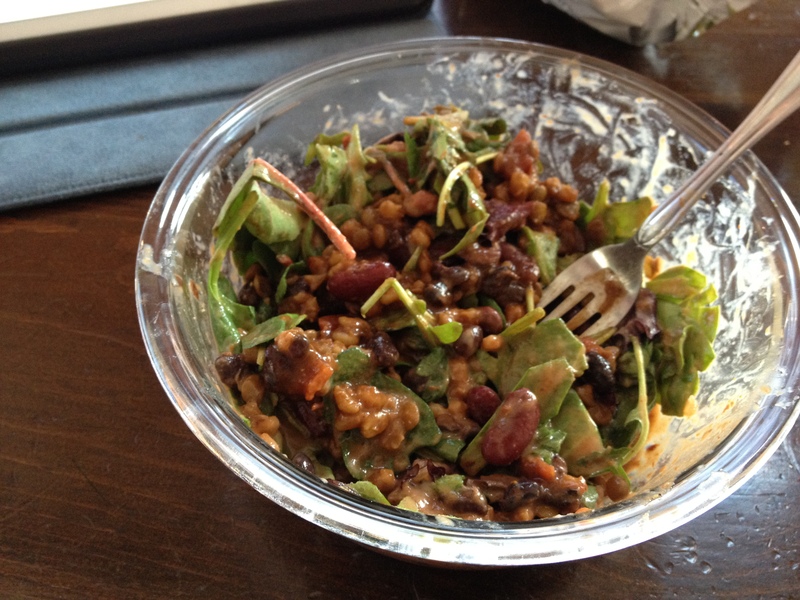 This recipe is adapted from Baker By Nature , I changed it up a good bit, and made it vegan, but same idea. They turned out quite delicious. My husband, who doesn’t like baked goods for breakfast (I know, how strange is that), ate three. Preheat oven to 400°(F). Line a large baking sheet with parchment paper or a non-stick baking mat; set aside. In a large bowl mix together 2 1/2 cups of the flour, salt, baking powder, baking soda, sugar, and cinnamon. Cut the Earth Balance and vegetable shortening into small cubes then quickly work it into the mixture (using a pastry blender) until it resembles a coarse meal. In a small bowl, whisk together the banana and milk, then add to flour mixture. 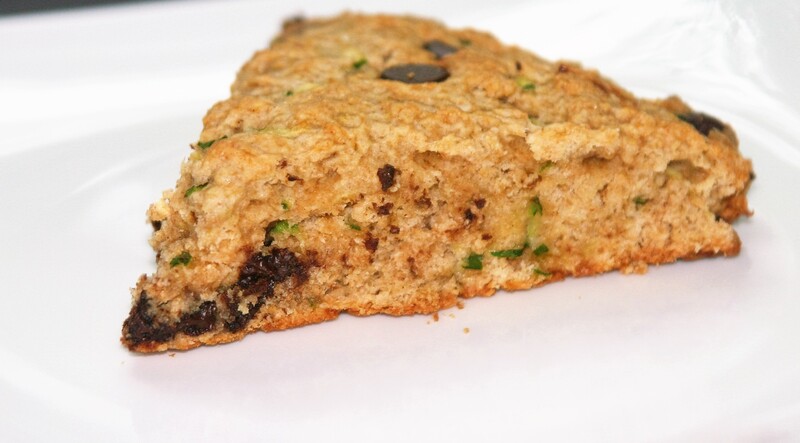 Add the grated zucchini, and chocolate chips to the scone mixture; gently fold them into dough with a spatula until combined. Pour the shaggy dough out onto a clean, floured work surface and shape the dough (you will have to work/knead it quite a bit to get it together) into an 8-inch circle. Cut the dough into 8 wedges and carefully transfer them to the prepared sheet. Bake for 20-22 minutes, or until the tops are golden brown. Cool for about 10 minutes on the pan before transferring to a cooling rack, or your plate. 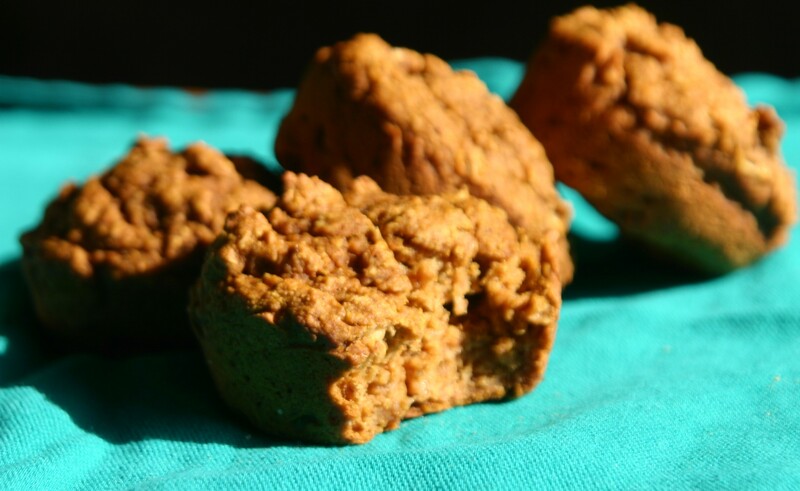 These muffins are full of vegetables and whole grains, yet are still delicious! They are moist, singing with warm spices, and bring thoughts of sitting outside watching the leaves fall and drinking tea. For me fall is a time to snuggle in, and get ready for new beginnings. I have started most of my jobs in the fall, started school, and moved several times in the fall. I even married my amazing husband in the fall almost four years ago. I love thinking of that time, and remembering the excitement I felt as we prepared for the big day, and enjoying the peace after it was all over. The weather brings it all back for me and I love it! I hope you are finding peace within yourself as you prepare for the change of seasons. These muffins are the perfect snack to have while taking time to enjoy the present, or plan for the future. 1 cup shredded summer squash (yellow), or apple, or carrot, or hard squash, or whatever you have on hand. Preheat oven to 375 degrees F. and prepare a 12-cup muffin pan with paper liners or oil. Whisk together the dry ingredients (flours, cinnamon, cloves, ginger, nutmeg, and salt). Stir in the wet ingredients (squash, pumpkin, milk, syrup, oil, vinegar, until just combined. 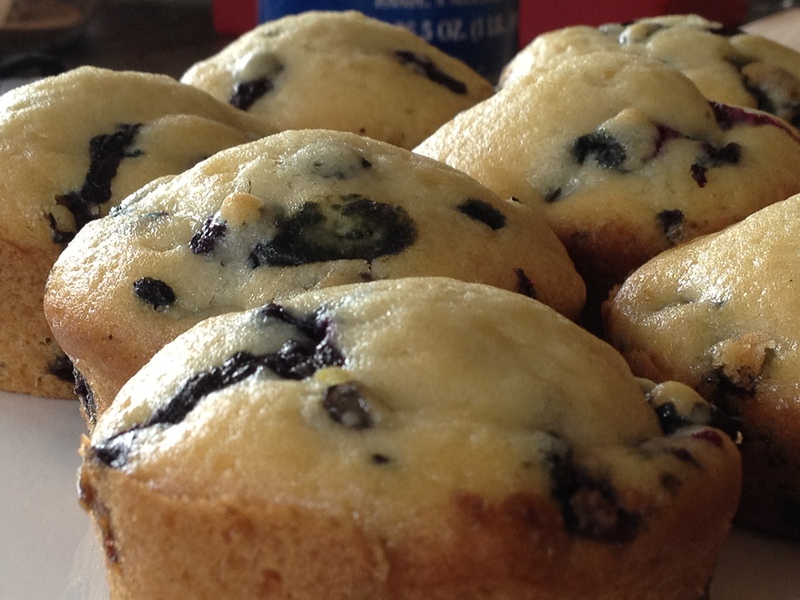 Pour the batter evenly into the prepared muffin cups. Bake in preheated oven for 20-25 minutes until a toothpick inserted in the center of a muffin comes out clean. Let them cool for about 5 minutes in the pan before removing them to a cooling rack. Enjoy warm, cool, or freeze for a quick breakfast. Last week we started talking about how to cook without a recipe using oatmeal as the basis for discussion. This week I wanted to continue using oatmeal and illustrate how using combinations creates a totally different oatmeal. For this we are going to have dessert for breakfast, or Dark Side Oats, as my husband calls them. This is a delicious combination of chocolate, peanut butter, and a bit of milk to make a lovely balanced breakfast. Bring water, vanilla and salt to a low boil over medium heat. 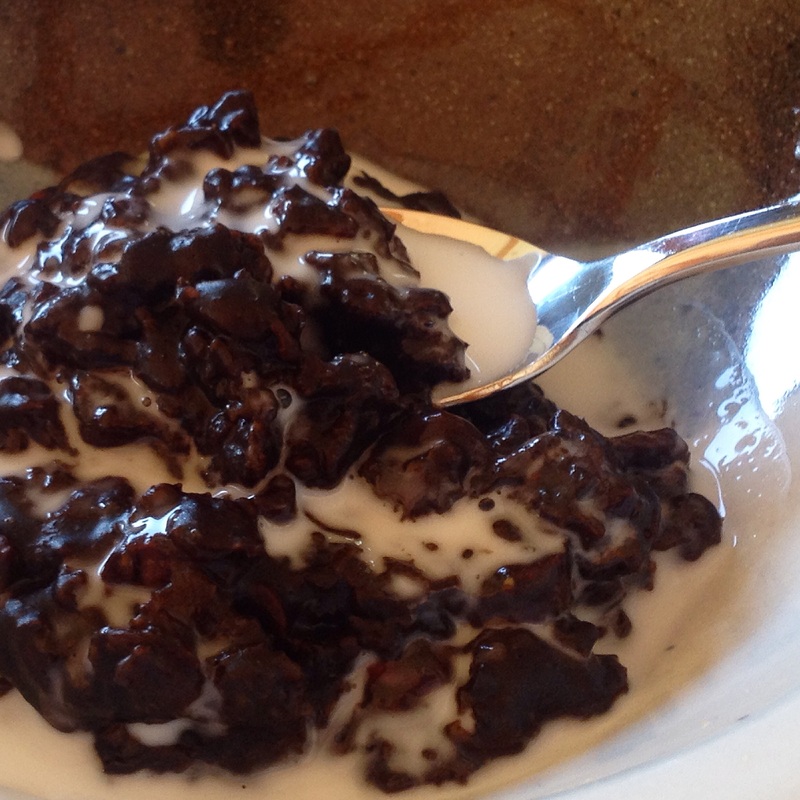 Reduce heat to medium-low and add oats and cocoa powder stirring to combine. Heat and cook stirring occasionally until mixture has thickened, about 5 minutes. Stir in peanut butter and brown sugar. Top with milk if using and serve immediately. I wanted a chocolate filled breakfast, but one that I could still call healthy without too much sugar. I also wanted something that balanced salty and sweet. I started with unsweetened chocolate which needs some sugar to balance it. This gave me bitterness and sweetness. I then wanted the salt factor and chose crunchy salted peanut butter. Crunchy peanut butter also gives the dish texture. Once all of these ingredients were combined the dish was delicious, but a bit dense. To lighten the dish I recommend serving cold milk over the top which will give balance to the finished product. To recap, bitterness (chocolate) balanced with sweetness (sugar) balanced with salt (peanut butter), add texture (crunchy peanut butter), with a little lightness (milk). Done and done. So you’re looking for food to serve the vegan mother in you life for Mother’s Day. Good job; you’re working hard to fulfill her desires and it will be appreciated. Just for you, I’ll tell you what I would love for a food-filled vegan Mother’s Day. 1. 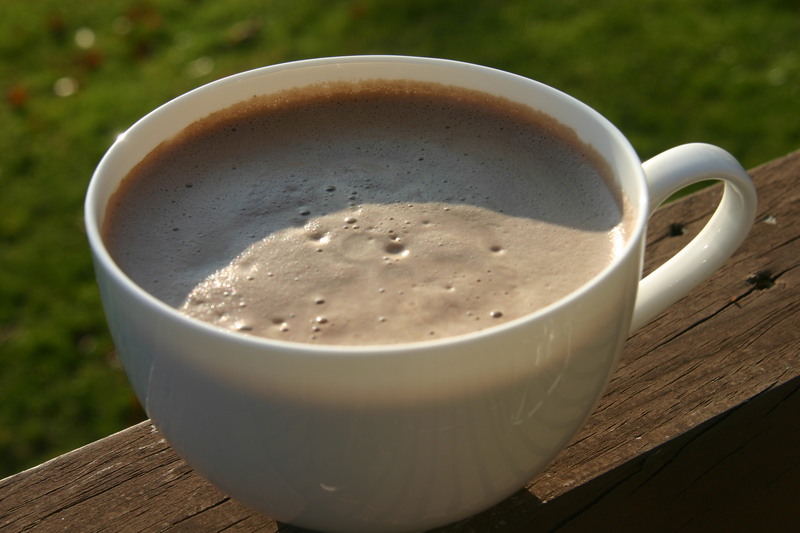 Start with vegan hot chocolate. If she’s into it, and most mothers are, add a shot, or ten, of espresso to make this a mocha. 2. 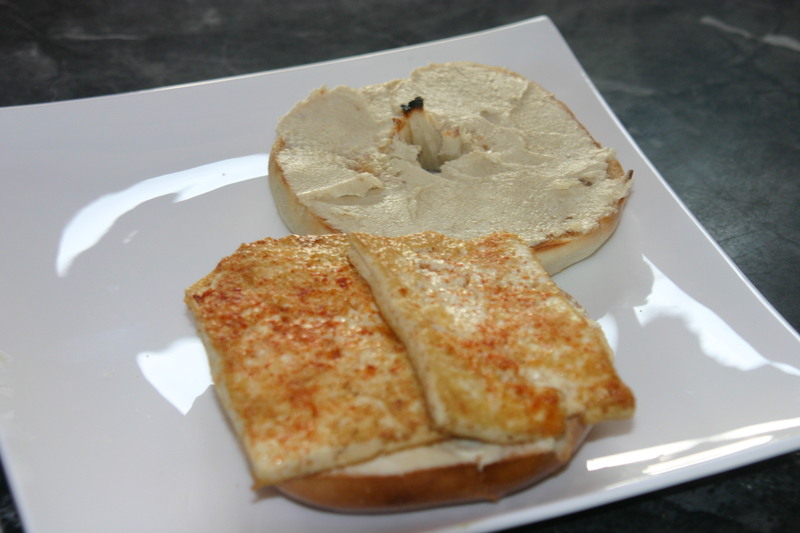 For first breakfast choose something savory such as a tofu breakfast sandwich, or just a delightful jalapeno bagel. If your special vegan is also gluten free try this savory oatmeal. For extra credit you can make the bagel at home. Just for you I made a video in case you’re going for the big wow factor. 3. Of course, she will need a late morning snack. I suggest something sweet again and bakery quality. 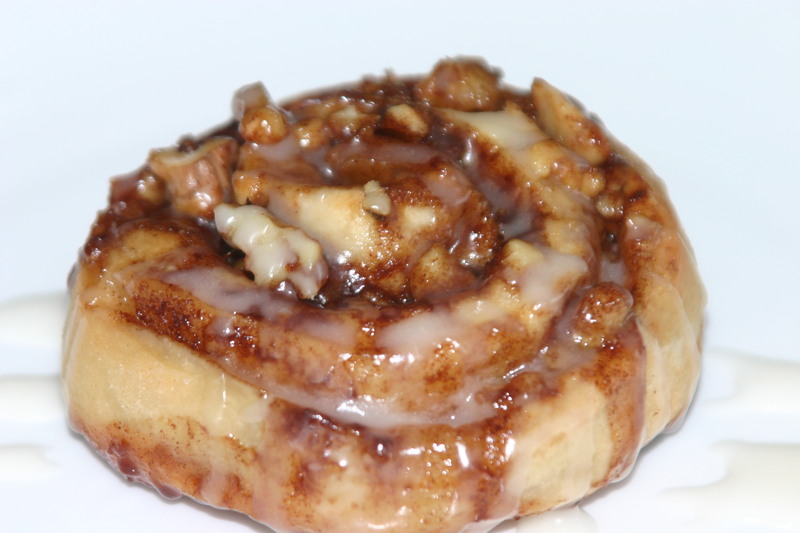 Maybe a blueberry muffin or cinnamon bun with another cup of coffee. Preferably iced at this point. 4. Just a salad for lunch please to balance the morning and get her ready for the delightful dinner you are going to prepare. 5. 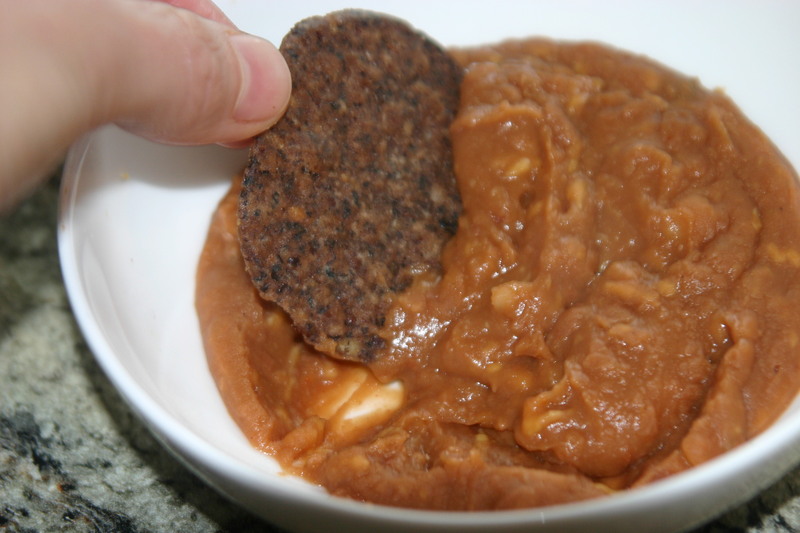 Now a little appetizer of happy comfort served up in this smoky bean dip. 6. 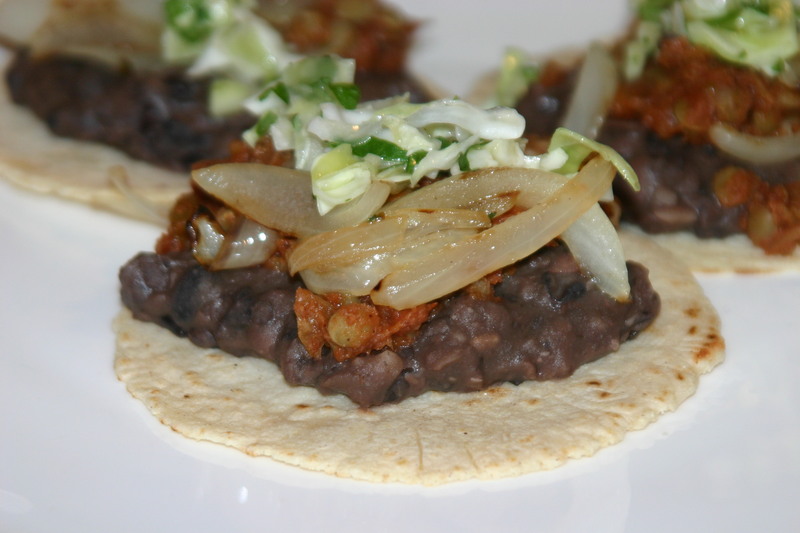 For dinner I’m going between these lentil tacos, or a pasta with vegan alfredo sauce. Hmm, I guess I’ll leave it up to the cook. 7. Dessert, the most important part of the day! You have a few options, but in my world they are all chocolate. 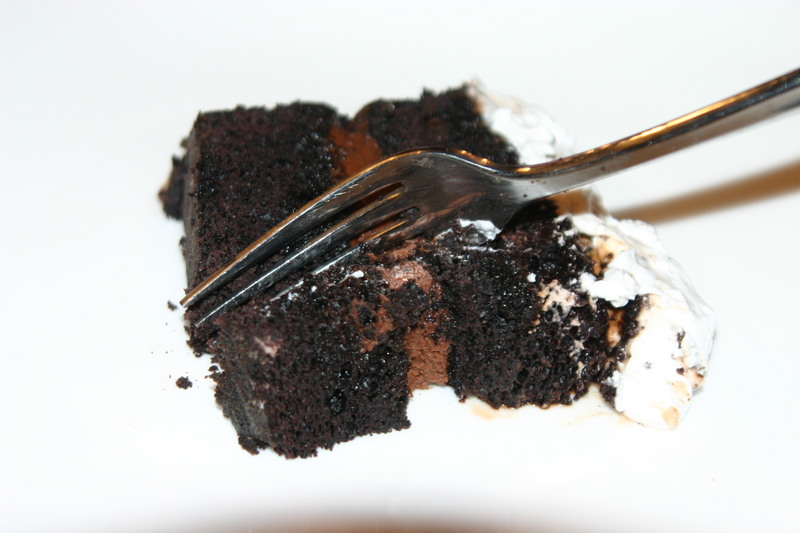 My first choice would be this vegan French Silk Pie. You could also do a chocolate cake, or chocolate chip cookies. 8. Good luck and thank you. The person you are cooking for will love the fact that you took the time to figure out and make something special just for her. Happy Mother’s Day! I have extremely fond memories of helping my mother make granola when I was a child. We would make huge batches, divide it up and each of us got to add the ingredients we liked. She always added dried fruit to hers, my brothers hated nuts, so on. We had this huge silver bowl that we would make the granola in and I remember standing on a kitchen chair to stir; stealing bites from the bowl when my mom wasn’t looking. Then the smell. Oh, the smell. It was so wonderful, for hours it drifted out of the kitchen perfuming the house. The best was eating it while it was still warm with cold milk (soy even then). This recipe takes a little time though it is very easy. You just have to be around the house for a few hours and available to stir the granola every 20 minutes. Whenever I make a batch of this granola I end up eating it 3 or 4 times a day for the first week because it is so good. It’s great for a snack, breakfast, and dessert. Remember this recipe is flexible so use the ingredients you like. Heat oil, maple syrup and water in a pan. When warm remove from heat and add extracts. Pour hot liquid over dry ingredients and mix together. 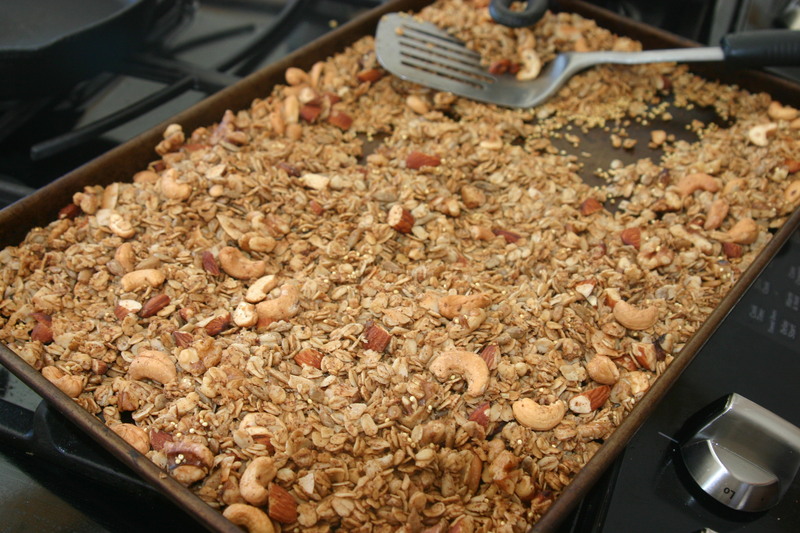 Divide between enough shallow baking pans to evenly spread the granola in a single thin layer. About 3 9 x 13 or larger pans. Cook in 250 F. oven, stirring every 20 minutes until granola becomes golden brown and dries out. About 1-1 1/2 hours. Granola will become crunchier as it cools. After granola cools add dried fruit if using.